Welcome to the Fall 2018 issue of Reach Out. As UBC has recently launched its 10-year strategic plan Shaping UBC’s Next Century, it has a new roadmap to guide decisions and actions – inspiring the very best in our students, faculty, staff, alumni and partners. As a leader in this Faculty, I’m pleased that the work we started under our 2016-2020 Action Plan aligns with UBC’s core areas of People and Places, Local and Global Engagement, Transformative Learning and Research Excellence. In this issue, you can see how Land and Food Systems is advancing Local and Global Engagement and People and Places through research that brings together Indigenous groups within our unique community space at UBC Farm. At the farm’s xʷc̓ic̓əsəm Garden (Indigenous Health Research and Education Garden), Indigenous land-based teaching and learning may help to transform future Indigenous food systems. This project acknowledges that learning through carving, orality, and relationality is as important as learning from textbooks inside a classroom. Transformative Learning is also taking place. This year we launched a new program to support re-wilding elephants used in the tourist trade and four undergraduate students have just returned from a summer in Thailand. For these students, studying abroad was life changing as much for the cultural immersion as it was for the academic experience. This issue also shares an example of our Research Excellence. Our faculty members are measuring greenhouse gas (GHG) emissions from farms and soils using funding from Agriculture and Agri-Foods Canada. The agricultural sector is the world’s second largest GHG emitter and this project may affect how Canada reports agricultural climate impacts to the Intergovernmental Panel on Climate Change. We are excited to share these stories with you as we travel the road to UBC’s next century together. 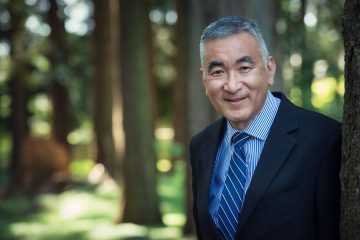 I always welcome feedback and invite you to connect with me at lfs.dean@ubc.ca.